New 2017 Ford EcoSport Review- It Just Got Better! Ford EcoSport started the trend of the compact sub-4 meter SUVs in India and the latest version of the car just pushes the bar for the segment further higher. We drove the new 2017 Ford EcoSport at a media drive event recently. We drove both the Petrol and Diesel variants of the car. In this review, we share our views about both the variants and what we feel about this new model. We try to cover all the practical aspects which you should consider before buying. Let us get started. 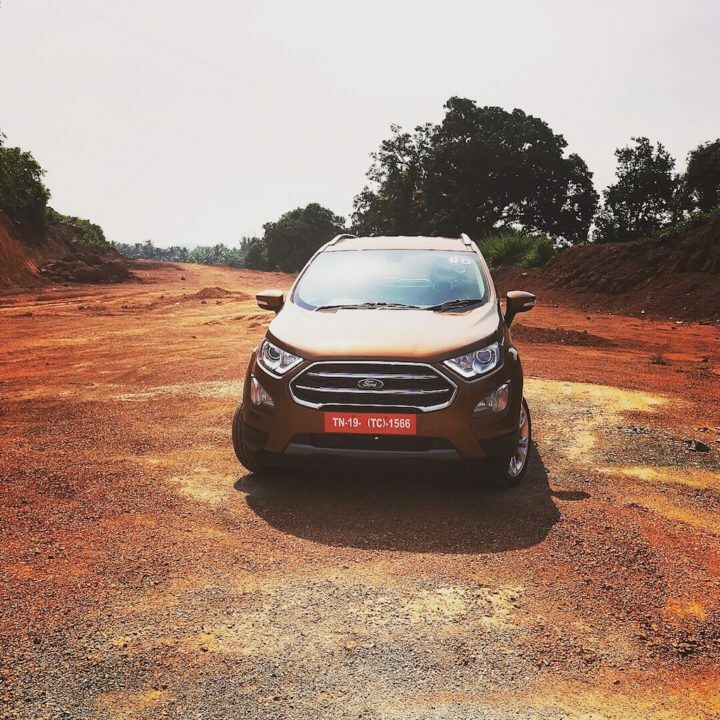 2017 Ford EcoSport gets a new front. Although it looks very familiar if you are familiar with the previous model, yet it has got elements which clearly differentiate it. For starters, the grill is now higher, looks even more aggressive and larger. It gives a very masculine appeal to the car. There is ample chrome on the grille but not so much that it makes it gaudy. The sporty scuff plate at the lower end of the bumper looks very sporty. The DRLs and large fog lamps look very attractive and give it a smart front fascia with the capability to turn heads. 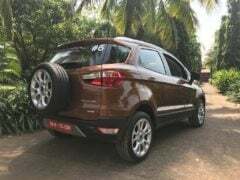 The side of the car looks more or less similar in profile to the ongoing model and it is not a bad thing at all. The car looks tall, sporty and the body lines with bold wheel arches make a strong statement. The rear also looks quite familiar and the spare wheel mounted on the rear of the car (retailed from the previous model) still looks very sporty and tasteful. In short, we really like the way this car looks and it is a head-turner! The interiors of the car have also been revamped. You get a new infotainment system with 8-inch touchscreen. 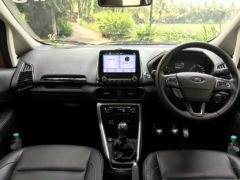 The placement of the touch-screen seems quite odd at first as it is slightly higher than usual placement of an infotainment screen, but just after driving the car for 30 minutes, we could notice the benefits of the higher position. 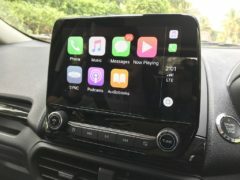 Since it comes with Android Auto and Apple Car Play support, it is able to run navigation on the screen. 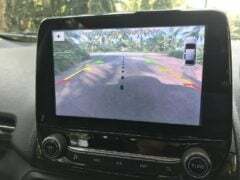 When driving, the high position of the screen makes it very easy to glance at it for directions without taking your eyes off the road. 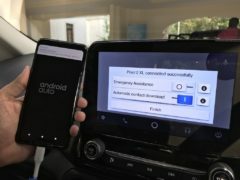 Also, all the infotainment and phone controls are provided on the steering wheel, so you don’t have to take your hands off the wheel to operate this unit. 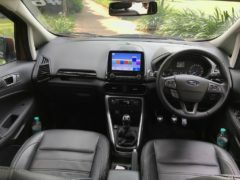 The dashboard looks quite premium and nicely finished with the use of soft & premium materials. The quality feels very high and is pleasing to the eyes and touch. There are ample storage spaces around the cabin. All 5 seats are very comfortable and offer great back and under-thigh support. 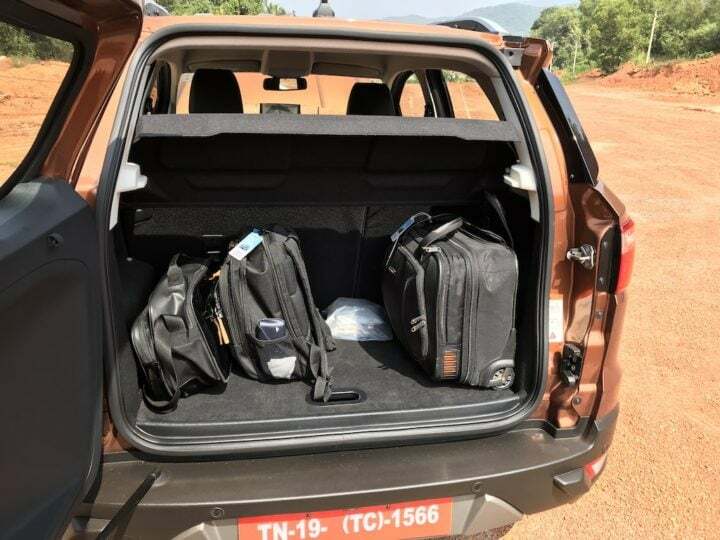 The leg-room at the rear is also good considering that it offers a huge boot and large seats. 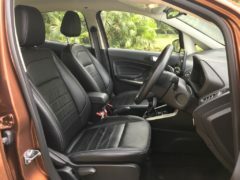 Front seats get an armrest in the middle with storage underneath it. The shoulder room at the rear maybe a squeeze if you plan to fit 3 passengers on the rear seat, but for 2 passengers and a kid, space is comfortable. Legroom and headroom are both quite good. 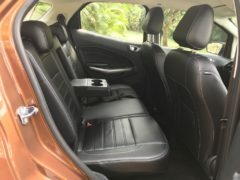 There is also a foldable armrest with cup holders in the middle of the rear seat. The boot of the car is probably the best you can get in a sub-4 meter car. Loading height is also very convenient and space is pretty good for regular city use or airport commutes. The 60:40 split seats can be folded to make even more boot space as per need. 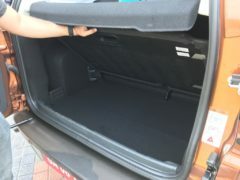 There is also a shelf-like tray provided on the floor of the boot with 3 different settings. 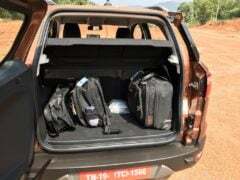 It provides a small hidden compartment wherein you can store valuables like laptop etc. which will not be visible until you lift that tray. Summing up the interiors, the 2017 Ford EcoSport has ample space and it feels very upmarket. The suspension setup is slightly on the stiffer side which ensures no noticeable body roll and very confidence inspiring handling. 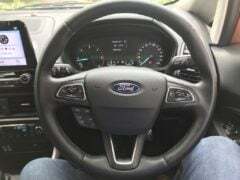 The steering wheel is also well weighted to give you ample road feedback. 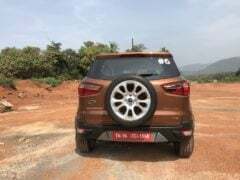 The ride quality is also quite comfortable with large 17-inch wheels which manage to soak small irregularities on the roads. 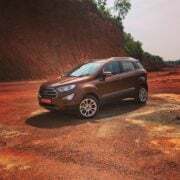 The 2017 Ford EcoSport is a lot of fun to drive with sharp handling and confident cornering and braking capabilities. 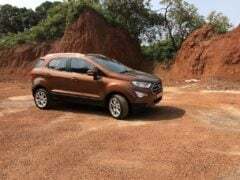 The petrol variant gets a new 1.5 litre 3 cylinder petrol motor which produces 123 PS of peak power and 150 Nm of torque. 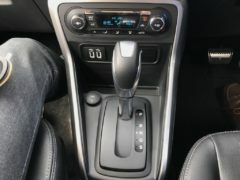 It comes mated to either a 5-speed manual or a 6-speed torque converter automatic transmission. 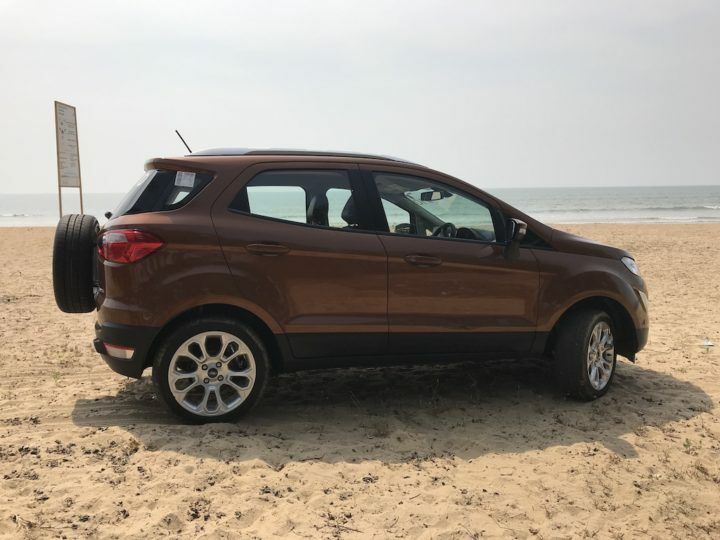 We drove the automatic variant of the petrol model of the 2017 Ford EcoSport. We found that the car is tuned more for fuel efficiency than performance. It picks up gradually and offers moderate acceleration. But if you are an enthusiastic driver and want some thrill, there is an S mode (Sports Mode) on the Titanium AT variant. The S mode makes the car much more agile and sporty, but it comes at the cost of fuel economy. There are also paddle shifters behind the steering wheels if you prefer taking the gearing-control in your hands. In our mixed drive with S and D mode over city and highway roads, we got a mileage of around 12.3 KMPL, which is not bad at all! If you drive gently and don’t push the car too hard, you can expect around 13 to 14 KMPL of mileage. Ford has discontinues the EcoBoost 1 litre petrol engine variant from the lineup. 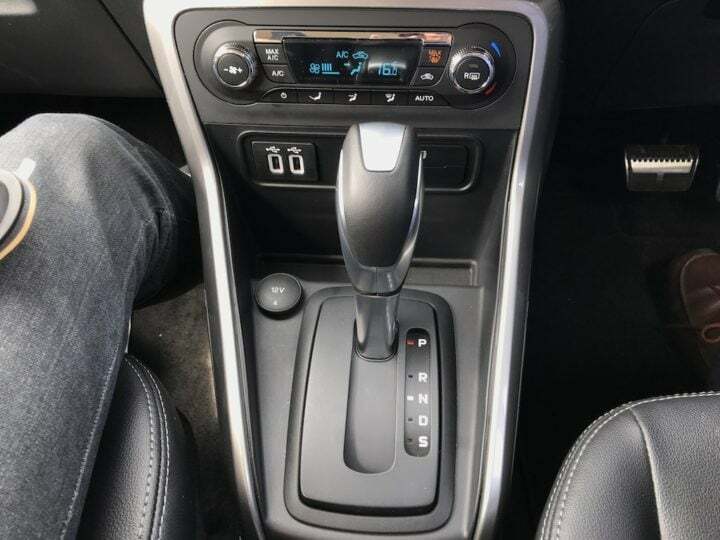 Also, another change is the use of a 6-speed torque-converter based transmission compared to the dual clutch system which was used on the earlier model. 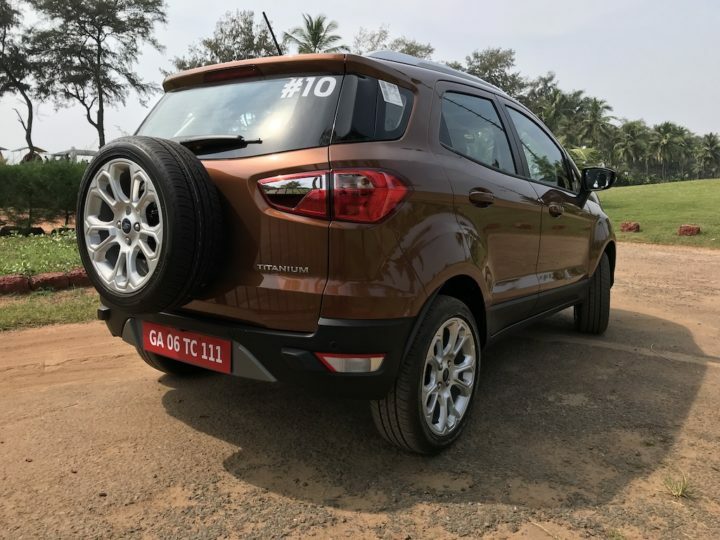 When we talked to the Ford official about why they made this change, they told us that as per Indian driving conditions, a torque converter is better suited. The diesel variant is the familiar 100 PS 1.5 litre TDCI diesel motor taken from the previous model. 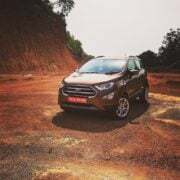 It delivers a peak torque of 205 Nm. The engine is very smooth and refined and does not exhibit any noticeable turbo-lag. In fact, the low-end torque is so good that you don’t need to change gears so often in city traffic. Even at as low as 1000 RPM, the engine pulls up the car without any judder. The noise insulation inside the cabin is quite good and the cabin is quiet and comfortable. This motor is quite punchy and fun to drive. At the same time, it gives you good fuel economy as well. In city driving, you can expect around 16 to 18 KMPL while on highways, it can easily return around 20 KMPL of mileage. 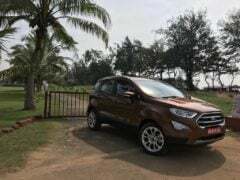 After driving the petrol automatic and diesel manual variants of the 2017 Ford EcoSport, I can confidently say that both the cars are very sorted. 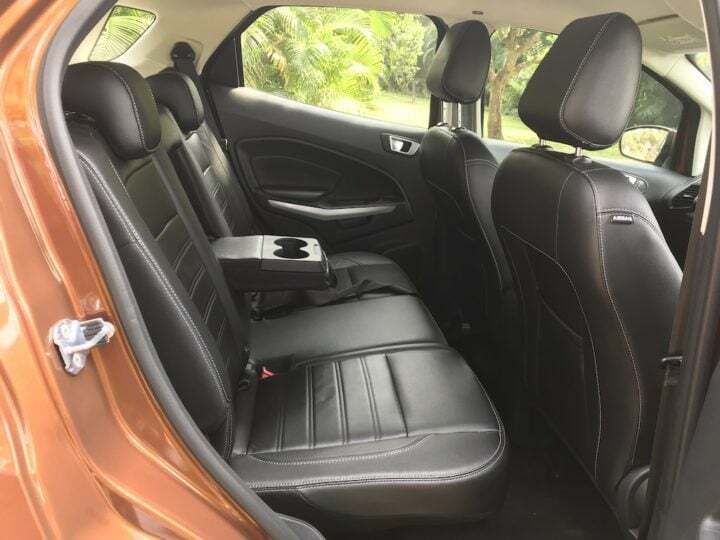 If you want a car which delivers you high quality, premium feel, ample space, a lot of features, high safety along with good mileage, the 2017 Ford EcoSport checks all the right boxes.